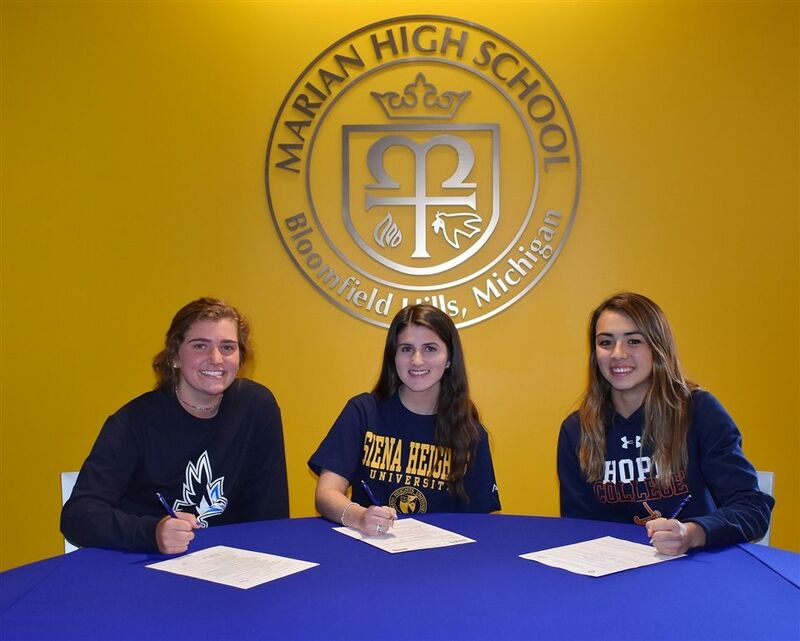 Three Marian High School seniors signed national letters of intent to play their sports in college. Alexandra Robb will play golf at Keiser University; Bridget Sacca will participate in competitive dance at Siena Heights University, and Emily Schlabach will swim for Hope College. Alexandra, the daughter of Becky and Bob Robb of Oakland, plans to study sports management while playing golf at the Fort Lauderdale, FL university. She received All State and All Academic awards in 2015 and 2016. “Marian coaches and teachers always encouraged me and helped me be the best that I could be,” Alexandra said. She was a member of Marian’s SADD and Ambassador clubs. The daughter of Eileen and Dominic Sacca of Bloomfield Hills, Bridget plans to study elementary education at Siena Heights, located in Adrian, MI. Bridget and Marian’s dance team did service work with Global Health Charities. In addition, Bridget was a member of SADD and the Ambassador Club. “Marian’s role in my success has been huge,” Bridget said, “not only in the classroom, but pushing me to become a better dance and better person. Marian’s community is amazing.” Bridget received All Catholic honors in the Catholic High School League dance competition. Emily Schlabach is the daughter of Kim and Steve Schlabach of Beverly Hills. She received the MVP and most improved honors as a member of Marian’s swim team. In addition to club membership and service work at Marian, Emily also worked as a lifeguard. She plans to study nursing while swimming at the Holland, MI college.